Azure SQL data discovery tool is a crucial part of the database security system that identifies sensitive data and helps you apply security measures targeted to avoid sensitive data breaches. Get a full visibility of your confidential data with DataSunrise. Complex systems of IT environments store big amounts of sensitive data which should be stored with special care. Sometimes it is hard to keep in control all the data transactions across various platforms. 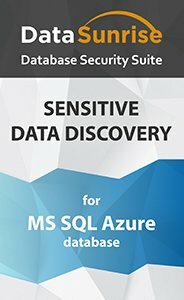 Azure SQL sensitive data discovery feature enables you to scan the database and detect sensitive data such as social security numbers, license plates, credit card numbers, personally identifiable information, medical data, etc. Data discovery tools help your organization mitigate risks of data leakage and comply information security laws and regulation (SOX, PCI DSS, HIPAA). The search engine is based on detecting matches with regular expressions for column names and column content. Security Rule. With the help of a scalable security rule, you can block all queries targeted to selected columns containing sensitive data leaving them available only for employees that use the data in work processes. You can also block the UPDATE and DELETE queries, leaving the data available for viewing. Audit Rule. It gives the opportunity of real-time monitoring of selected columns with sensitive data, which keeps you aware of who and when requested it. You can set it to notify via SNMP or SMPT when certain data is edited or deleted. Masking Rule. It is a helpful feature when working with third-party developers. It replaces the original content of selected columns with fake data, random or fixed characters. Ready patterns make it easy to mask PII, dates, numbers and other types of data. Sensibly configured rules help you automate time-consuming operations required for monitoring and protecting sensitive data. Rule settings are highly scalable to adjust to various business purposes. Detect and protect your sensitive data hosted on Azure SQL cloud databases with sensitive data discovery solution by DataSunrise.